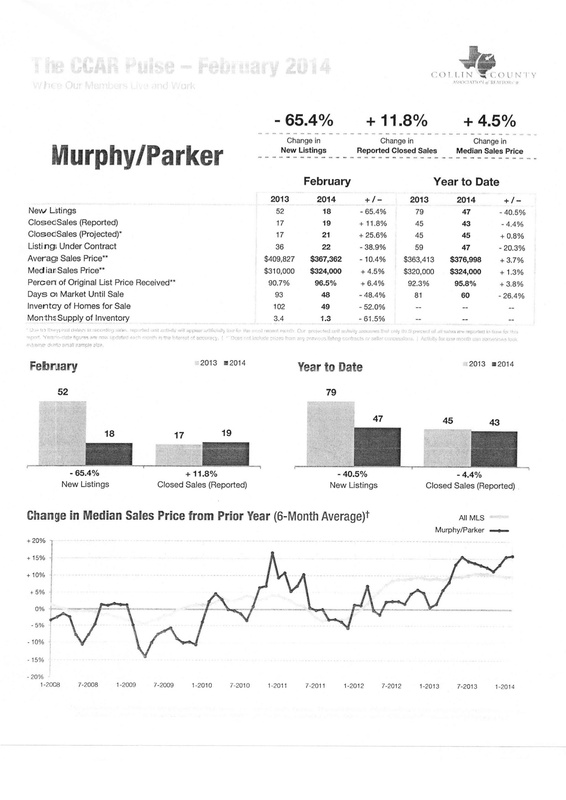 The Collin County Association of Realtors posted their statistics for February 2014 Home Sales in the Murphy and Parker areas. Some of the numbers are interesting! For example, new house listings this year were only 18 compared to 52 last year. Yet, this year 19 sales were closed compared to only 17 last year. The average sales price for a home is now $367,362 compared to last year’s $409,827. A house was on market for 48 days in February compared to 93 last year and 96.5% of the original list price was received! Year to Date the Murphy and Parker areas have listed 47 homes and closed 43. Their average sales price has been $376,998. They have been on the market for 60 days and have received 95.8% of the original list price. See the worksheet below for more detailed statistics!